“Where do we stay?” is one of the biggest questions you will ask yourself while vacation planning. Because it’s one of the largest parts of the vacation budget, it can be the most important decision you’ll make. If the accommodations aren’t quite right, your dream vacation can turn into a nightmare quickly. That’s why it’s so important to get the best value for your money. Of course, hotels are the natural first place many people look for accommodations for their travels. However, booking a vacation home for your Central Florida vacation can offer so many more benefits for your family than that of a typical hotel. If you have never considered a vacation home over a traditional hotel room, your next vacation is the perfect time to make the switch. In Orlando, our vacation home community is vibrant and almost always a better option than a hotel for the average family. When on a travel budget, bigger bang for your buck means your family can enjoy a luxury vacation on a shoestring budget. In fact, an entire home can be rented for the cost of a single hotel room! Imagine coming home from the parks at the end of the day with the kids, and while you relax on the couch and read a book, the kids head over to the game room in the same house! Or they throw on their swim suits and hit your private pool in the backyard while you read a book under the shaded porch. At bedtime, you tuck the kids into their own beds and shut the door. In a traditional hotel, if the kids need to sleep, you’re stuck in a dark small room with nothing to do if you aren’t ready to sleep. It’s cramped, and the bed is the only place for you to relax. A hotel room is not an escape, it’s a place to sleep and that’s it! However, a vacation home is a place for your whole family to retreat to after a long active day. It offers enough space to stretch out and relax in the comfort of a private home. If you are afraid you’ll miss the luxury resort amenities of a hotel, don’t fear. 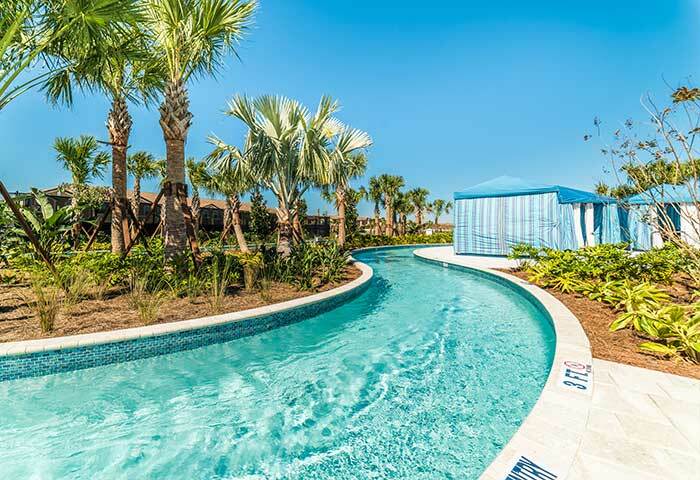 Many of the vacation homes Casa Floridian manages are in luxury home communities like Windsor at West Side and Champions Gate. 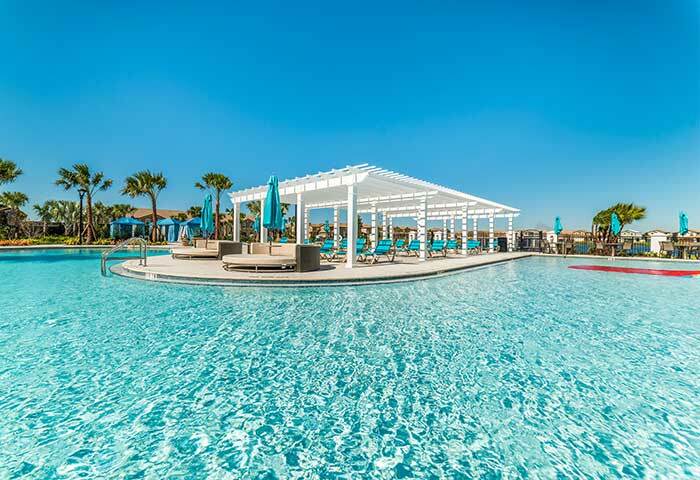 These communities have many of the same resort living accommodations you expect from a luxury hotel like fitness spas, a club house, a large community pool with lazy rivers, tiki bars and pool side cabanas, sundry shops, arcades, concierge service and more. Location is everything when it comes to luxury vacation, and you don’t want to spend all your time traveling back and forth to the park. The vacation homes offered by Casa Floridian are conveniently located close to all the major parks. That means you’ll spend less time in your car, and more time on a vacation you will love! Plus, unlike many hotels, you can pull your car right into your own private drive way and walk right through your front door. If you are worried about the cost of eating out every night, then that’s another reason you should chose a vacation home for your next vacation. With your own private kitchen, you have the option to cook as many of your family meals at home, cutting down on the amount of times you need to head out of the house to get a bite to eat. Pack less on your vacation too and cut down on all those luggage fees when you travel. Most vacation homes come with a private washer and dryer. A load of laundry or two while on your trip will help keep everyone well dressed in clean clothes. As you can see, there are so many reasons to choose a vacation home for your next vacation over a typical hotel room. Vacation homes offer full luxury accommodations with more room for less cost than those tired hotel rooms. For your next vacation, skip looking for the best price on a tiny hotel room and book an entire vacation home for the same price. You’ll enjoy your vacation so much more if you do!